If you have cruising on your bucket list but you or your mate need some help getting started then our Cruising 101 Seminar is your first adventure…Ask Captain Chris about cruising FUNdamentals! What To Know Before You Go! This comprehensive seminar will open your eyes to the life of a cruiser and all the essentials you and your crew need to master before you leave the dock – in just 2 days with an optional boat yard tour on the third day. The Perfect Boat For You. Topics will include boat designs, styles, layouts, surveys, propulsion systems including single or twin engines, gas or diesel, thrusters and docking techniques that work for each. Navigation Made Easy. Review the latest in navigation resources including paper charts, electronic chart plotters, and internet websites that can help you plan your cruise for a day or the whole season. Learn about lights and other navigational assets while you discover how to interpret range makers, tides and currents. You’ll learn that navigation is much more than moving from one waypoint to the next and there’s no final exam! Docking & Anchoring Techniques. At the end of the day we all end up somewhere. 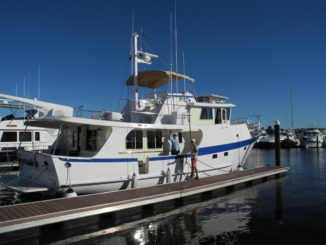 We are either swinging on the hook in a quiet anchorage or nestled in the perfect marina. The reasons for selecting one finale over another are sometimes based solely on our fear of the unknown…so come learn with Captain Chris! Crew Communication. Remember the first time you and your mate went boating together? Amazing that any of us make it past that initial adventure! Oh sure, we start with such high hopes for the idyllic cruise- the thrill of taking the helm for the first time. Some tips from a Boat Whisperer should keep you on track. Verbal communication, arm signals and Float Plans will be included. Vessel Communications. 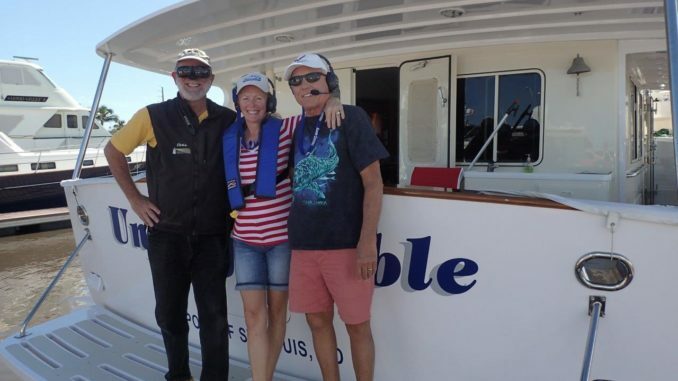 Explore with us the how-to of vessel intentions, whistle signals, internet, AIS, RADAR, SPOT and VHF radio. Sound like alphabet soup? Come learn more about each of these easy to use electronic tools found aboard more pleasure boats today. Confessions of a Galley Slave. Planning a weekend trip? Maybe cruising for a few months? Captain Alyse will share ideas, shortcuts and hints that will make your time in the galley another fun adventure. All of our galley recipes are easy to make and can work perfectly in the small confines of a one burner stove or toaster oven and one small square foot of counter space….as well as in the spacious galley of a large cruiser. With the right tools and the right attitude everything tastes better on a boat. Trip Planning. Plan a cruise starting here in Florida and we will show you how easy it is to go anywhere! From selecting each port of call to provisioning groceries, fuel and spare parts, Captains Chris and Alyse will coach you using various resources. Yes! You will be planning your next trip so bring your charts, guide books and iPad or tablet for a hands-on session. Line Handling. Practice a proper cleat knot to keep your boat secure. Learn how to tie a bowline and other useful knots for the confident cruiser. 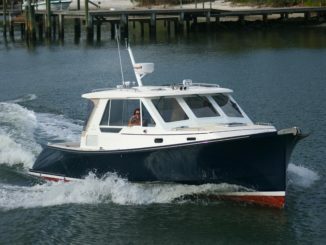 Trawler Training Kadey Krogen 58 with Solar Panels! Think Buyer’s Broker and Ask Captain Chris Why! 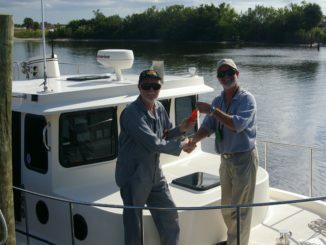 Phone: 772.205.1859 | chris@captainchrisyachtservices.com | Copyright © 2006 - 2019 Captain Chris Yacht Services LLC. All rights reserved.